Easy Way To Configure Mikrotik RB750G To Access The Internet. Even though the specification of the RB750G says that is is meant for small office and home users,the RB750 is much than a small router in a nice white plastic case. It comprises of five independent Gigabit Ethernet ports and optional Switch Chip functionality for wired speed Gigabit throughput. It comes compatible with power adapter to power on the router. It’s probably the most affordable Multi Protocol Lan Switching capable router in the market today. With compact design and clean looks, it will fit perfectly into any SOHO environment. 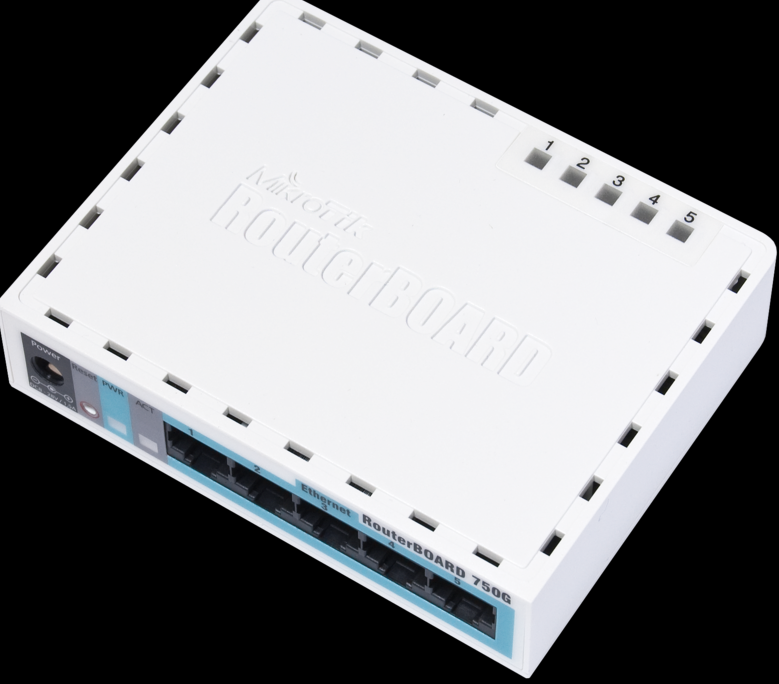 With mikrotik devices you ca do a lot and yet again, comparing to RB750, the G version adds not only Gigabit capable ports, but also a new 680MHz Atheros 7161 CPU for increased throughput. Up to 580Mbps throughout with larger packets, and up to 91500pps with small packets!. The RB750G can be configured for each of the ports to be on separate network and do their separate switching also. The best way to start configuration on mikrotik RB750G is to change your system IP address, to be on the same network with the Mikrotik router default 192.168.88.1. To do that, right click on your network icon click on network sharing and do your IP configuration or read here, to learn how to configure IP address on a system. When you’re done with the set up, next thing is to lunch your Winbox application to access your Mikrotik RB750. For me I normally Log in with Mac address. Click on new terminal to remove initial configuration if there is any initial configurations done on the router before now, by using this simple command < system reset> then reply yes to the dialog question, at this point you have a brand new router ready for configuration. Once you’re on the configuration interface click on system and click on identity to give your router a meaningful name. (RB750). Click on IP <<<<<< click on Address >>>>>>> click on the + sign to add your ether 1 IP address which is routing to the internet this could be the public IP of the client or the LAN IP and the ether 2 or 3 address should then be assigned IP within your local which will link to a switch or the wireless device your about to broadcast with, then apply and Ok it. Next click on IP >>>>> click on firewall >>>>> click on NAT >>> click on the red plus + sign to add your NAT IP. On the src address add your NAT IP, the NAT should be the gate way or the dot zero of your LAN >>>>>> click on ACTION and choose masquerade apply and OK.
NEXT is to configure Route: To configure route, click on IP >>>>>> click on routes >>>> click on the plus sign +, click on the gateway to add route, your route address is the gateway address with which your service provider goes to the internet after then you click on Apply and ok. At this point if you followed very well next thing is to change you IP address to your local and you should have internet at this point. To test your connection, go to your command prompt by typing cmd on the search bar and hit enter. Then try pinging the internet. by typing ping www.gmail.com or any other public DNS. Thanks for stopping by, and please drop your comments on the box below. How To Configure MikroTik Site to Site VPN with L2TP/IPsec. How To Configure Hotspot On mikrotik Routers.